The story of the Texas Navy is one of the most compelling yet unknown sagas in the history of the Lone Star State. Created in the throes of revolution, the First Texas Navy played a vital role in helping Texas win her independence from Mexico. The Second Texas Navy was one of the most active military elements of the Republic of Texas – its actions highlighting the struggles of a young country trying to maintain its sovereignty and establish itself among the family of nations. Despite this, the story of the Texas Navy is not generally known. Moreover, it is mentioned only in passing in our schools and receives scant attention in other venues. A few museums around the state, mostly along the coast, have minor exhibits on the Texas Navy. Generally speaking, however, it is treated as a sidebar. The Texas Military Forces Museum has changed that fact. In November 2013 the museum opened a major expansion, renovation and redesign of its 19th Century gallery. 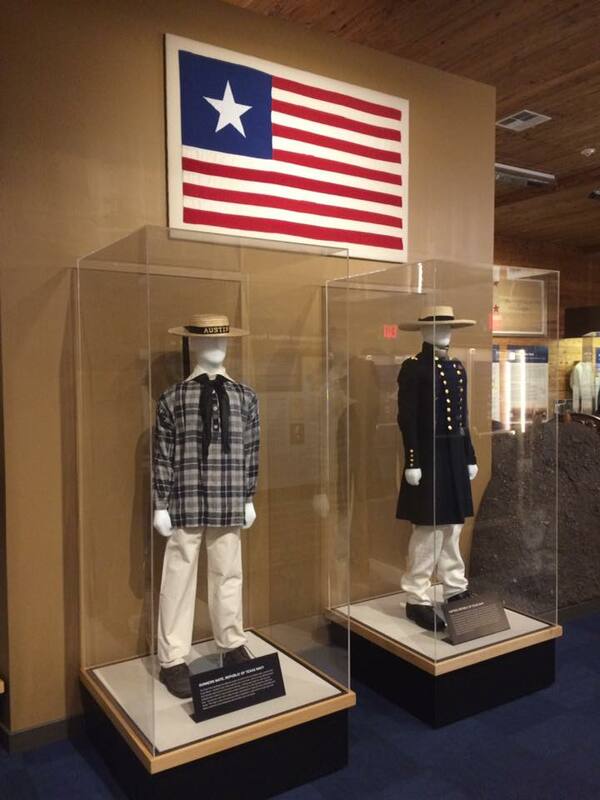 Among the features of this new 3,600-square foot gallery is a dramatic exhibit highlighting the role that both the First and Second Texas Navy played in the early years of the Republic. The exhibit – funded by the Texas Military Forces Historical Foundation and the Texas Navy Association (www.texasnavy.org ) – is experiential and allows visitors to stroll up a gangplank onto a replicated ship’s deck and view a recreated bulkhead, complete with a cannon on a naval gun carriage “run out” and ready to fire through its gun port. The cannon is a replica of the famous “golden standard” which was captured from the Mexican Army at San Jacinto and turned over to the Texas Navy afterwards. A similar bulkhead, minus the cannon, graces the wall on the opposite side of the room. 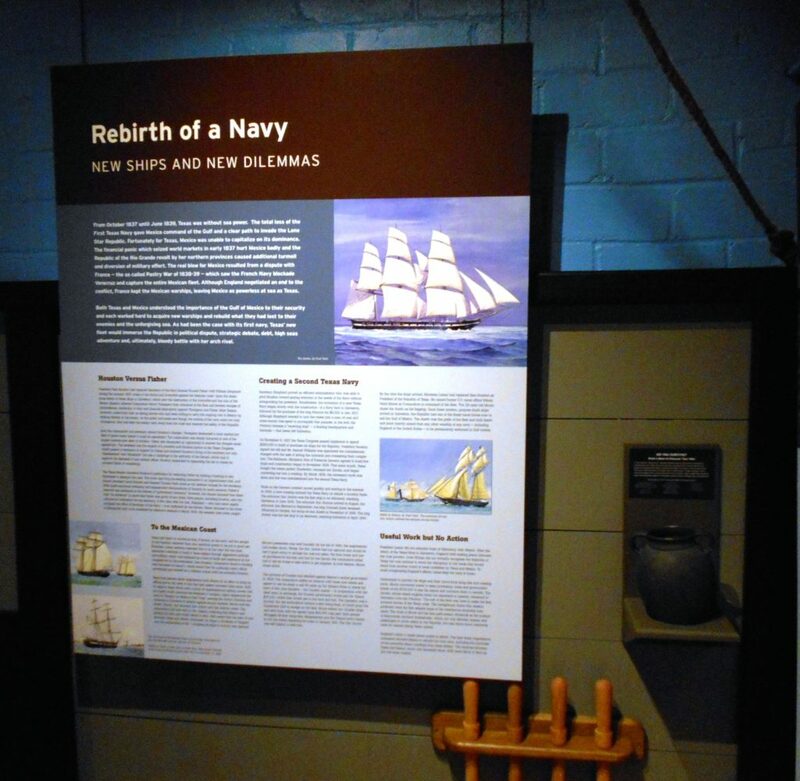 Large format exhibit panels detailing the history of the Texas Navy are mounted on the surrounding walls. This entry was posted in Exhibit. Bookmark the permalink.